In small bowl, mix 1 tablespoon of the oil, the chili-garlic sauce, soy sauce, garlic, sugar, peanut butter and water until smooth. Set aside. In 12-inch nonstick skillet, heat remaining 1 tablespoon oil over medium-high heat until hot. Add chicken; cook 5 to 6 minutes, stirring frequently, until chicken is no longer pink in center. Remove chicken from skillet; cover to keep warm. In same skillet, heat soy sauce mixture over medium-high heat until hot. Add contents of bag of meal starter; cook 6 to 8 minutes, stirring frequently, until vegetables are crisp-tender. Add chicken; stir to coat. Remove from heat. Pat lettuce dry with paper towel; arrange on part of large serving platter. Spoon carrots onto platter next to lettuce. Arrange chicken mixture on platter. Sprinkle with peanuts, onions and cilantro. 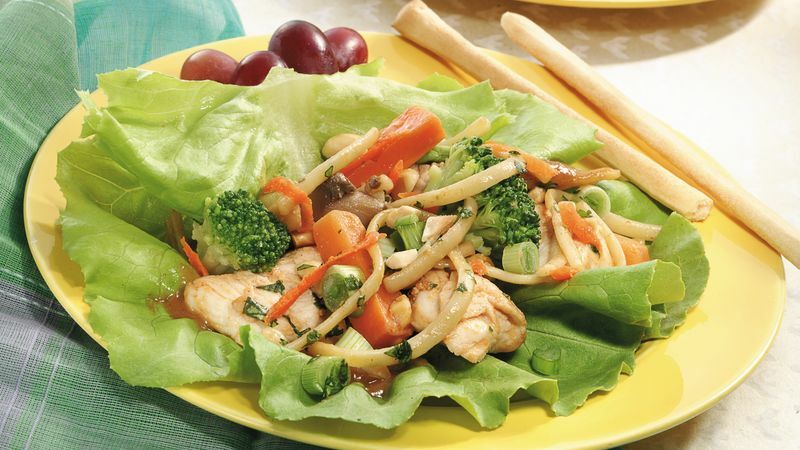 To serve, top each letttuce leaf with chicken-vegetable mixture and carrots. Wrap lettuce around filling.